The internal shell of the animal Sepiella maindroni de Rochebrune or Sepia esculenta Hoyle of the family Sepiidae. Produced in coastal regions such as Jiangsu, Zhejiang, Liaoning provinces in China. Collected the internal shell, cleaned and dried. Salty, astringent, slightly warm; kidney and liver meridians entered. Secure essence and stop leukorrhagia, astringe to stop bleeding, restrain acidity and alleviate pain. Dry dampness and cure the sores and ulcer when used externally. It can secure essence and stop leukorrhagia, and is good at astringing leukorrhea especially. For leukorrhagia due to kidney deficiency and insecurity of belt vessel, it is combined with herbs to tonify kidney and astringe. For instance, it is used with Shan Yao, Qian Shi, and Lu Jiao Shuang. For vaginal discharge, it is combined with other leukorrhagia-stopping herbs. For instance, it is used with Qian Shi and Bai Zhi. For seminal emission, spermatorrhea due to insecurity of kidney, it is combined with kidney-tonifying and essence-securing herbs. For instance, it is used with Shan Zhu Yu, Tu Si Zi, Sha Yuan Zi. It can astringe to stop bleeding and is applied for many kinds of bleeding. For metrorrhagia and metrostaxis, it is combined with herbs to stop bleeding. For instance, it is used with Qian Cao, Zong Lv Tan and Wu Bei Zi in the formula Gu Chong Tang from Yi Xue Zhong Zhong Can Xi Lu. For hematemesis and hematochezia, it could be smashed into powder with Bai Ji at the ratio of 1:1. For blood stranguria, it could be smashed into powder and intaken with the juice of Sheng Di Huang. It is a good herb for stomachache and acid regurgitation because it can restrain acidity and alleviate pain. It is combined with Zhe Bei Mu, such as in the formula Wu Bei San, or with herbs to enhance the action of restraining acidity and alleviating pain. For instance, it is used with Yan Hu Suo, Bie Jia, Wu Bei Zi, etc. It can dry dampness and cure the sores and ulcer when used externally. For eczema, it could be smashed into powder for external use when combined with herbs such as Huang Bai, Qing Dai, calcined Shi Gao. 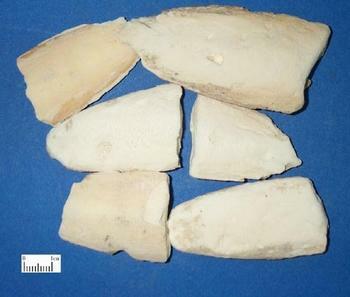 For incurable sores and ulcers with a lot of suppuration, it could be smashed into powder for external use singly or combined with calcined Shi Gao, Ku Fan, Bing Pian. Decoct 6~20 g. Powder 0.5~1g per time. Appropriate dosage for external usage.